Choose how much you want to bet per payline. You can pick up to 20. Bets start at £0.20 per spin and rise to 100. Change your bet amount by clicking the plus or minus symbols. By clicking the respin symbol on the upper right, you can autoplay with a selection of conditional stops. There are 3 rows and 5 reels with a shelf for potion vials placed above. When you have placed your bet, click the glowing green play button on the bubbling cauldron at the lower right. The symbols are themed to connect with the magical theme: there is a magic orb (wild), the alchemist, golden coins, colored potion vials as well as a chest of three elixirs and a “wonder potion” recipe book. There are also playing card values. The symbol which pays the most is the magic orb wild, delivering jackpots of 1000x bet for 5 on a payline. The wild can replace any symbol, except the potion vials to better your winning odds. Balthazar’s Wild Emporium, we have to admit, doesn’t have a very big fixed jackpot. The largest prize, which is won by spinning 5 Wilds (the magical orb), will land you 25x your bet. The next highest prize is the gold coin, and 5 of these will get you 20x your bet. These prizes aren’t astronomical, but are still pretty decent. Plus, this slot is mostly about all the extra wins you get from the special features – which can get you up to 500,000 coins with just one spin. Landing 2 potion vials on the first and second reels will trigger the gamble game. There you are given a set amount of free spins and a difficult choice: pick either a bonus prize by selling off your collected vials or gamble some or all of it in hopes of gaining additional vials. If you gamble, and a third potion vial shows on the third reel, you can win even more free spins. If you get 3, you can collect or gamble for more until you reach a maximum of 5. The extravagant Balthazar may appear at any moment to give you potion bonuses, potentially transforming a crushing loss into a spectacular win! The symbol of ‘potions wild’ adds wilds to the reels, while the ‘magic re-spin’ awards you a re-spin with a win guaranteed. The ‘snake eye’ potion reshuffles the reels, snake-like, to give you a win, while the ‘déjà vu’ potion spins back the reels to locate a potion. The ‘Dr Burns’ potion, on the other hand, incinerates a symbol to disclose underneath it a winning symbol. Balthazar’s Wild Emporium is a weird and enchanted world, filled with sights and sound which will keep you amused and entertained, hosted by the maroon-suited alchemist himself. The cauldron bubbles, pink flowers fall from the trees. The background sounds and music are magical, with birdsongs and natural tunes to get you in the mood for some potions – and big money wins. 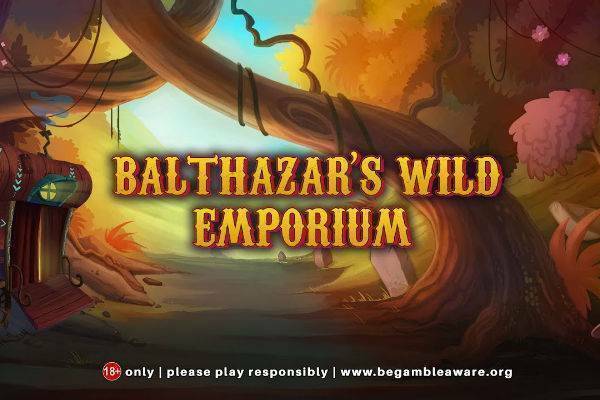 Balthazar’s Wild Emporium from Core Gaming is an odd, quirky filled with unexpected surprises. It is a world of imagination populated by magical potions and secrets waiting to be revealed. We mean this literally! The vials of potions can add free spins, respins to the game, and bonus features include hundreds of free spins. 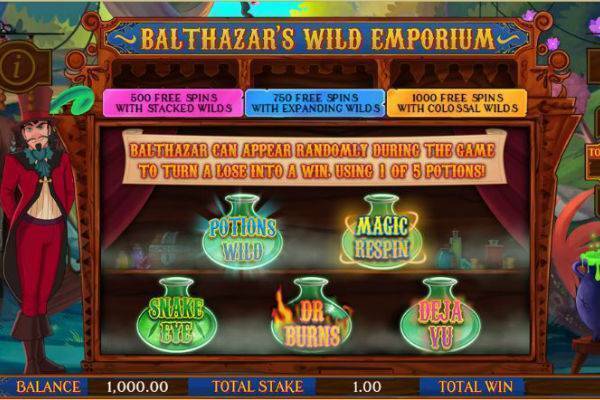 See why everyone is bewitched by Blathazar’s Wild Emporium at one of our recommended slot sites.